Illumination is hoping The Secret Life of Pets 2 will match the $875M success of its predecessor, and so they are rolling out character-specific trailers one-by-one so you don't forget. 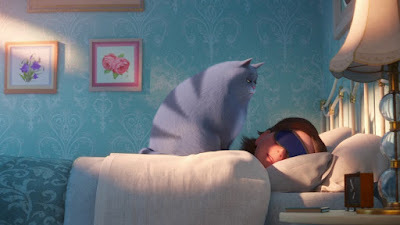 After the first teaser focused on Max, who is now voiced by Patton Oswalt, the latest features the portly feline Chloe, voiced by the terrific Lake Bell. As a cat person myself, I see way too much in Chloe that reminds me of my own pet. Let's face it, cats are onery creatures who want what they want when they want it. In this case, Chloe really wants to wake up her owner, but the only thing that seems to work? Vomiting up a hairball. I know from experience that the sound of a gagging cat will break even the deepest slumber. There's also a funny bit involving catnip, which is like crack cocaine for felines. Also featuring the voices of Kevin Hart, Tiffany Haddish, Eric Stonestreet, Jenny Slate, Nick Kroll, and Pete Holmes, The Secret Life of Pets 2 opens June 7th 2019.